What is she gazing down upon? What is she, thinking and what is she feeling? By inferring, or hinting at things just outside their view, my objective is to engage the viewer more. Photographs often, though not always, spell out a subject with exact precision. Recording textures, veins, size, color, width, weight. Documenting location, species and the individual. And some types… of art styles do as well. Which is great, when that is what is called for. When that is the feeling you are wanting to convey. A cataloguing of the details. However, its different with fast, five or ten minute sketches. Sketches done on the fly, capture the mood and essence of the thing. I feel, Subjects are more authentic, truer to their essence, when at rest. At ease. When allowed to be in a natural setting. In nature. Out in the forest, sitting amongst the rocks and logs. Being at home upon the banks of the river. These poses, can give the viewer more. Whether its in the form of photography, sketches, drawings, paintings, or other art forms. The limited palette of earthy browns and forest green, simple yet sufficient. Hinting at woodland themes. My subject sat leaned up against the tree logs and branches, head tucked. Maybe she was the young mother, or older sister, or aunt. Who knows? But she kept an eye on the child in pink. An active one at that. The hike there, to the bridge was fun. OK a challenge! But obviously, the child in pink still had plenty of go. Her watcher…. not so much. I smiled. Using this format, and this pose as well “downward gaze” shifts the viewers minds. To make them, ponder a bit. Take the viewer out of the little box where it is all explained already and nothing has been left unsaid. Take them out the world they are currently in, and help them to imagine the world this subject resides in. Allude to mysteries and things around the corner. Hint of magic yet to come. If a book has been so well explained and summarized, there is nothing new or exciting left to be revealed by looking further in the book, we will not. So too with our art. With our paintings, sketches, drawings, photographs. We will look for the exact time that it takes to define the plot. And then, we move on. Period. I think, as an artist, I prefer to try to keep the viewer wondering. Just a bit. Wandering through the scene, through the book… looking for, more. I do not, want my art to be ‘all spelled out’ and perfectly revealed in every fine detail. No. I’d like there to be a lovely fusion of lots of soft edges tempered with just the right balance of crisp edges to draw the eye. With warm colors telling you what is front, and cool paler colors speaking of far distant things. Lines that are curved to soften the mood, with diagonal directionals for subtle hints of movements. I’d like my sketches to be authentic. My art to be original, and real. And me. I aspire to keep my viewers, wandering through my artwork. Realising, of course, not all are going to be lovely frame worthy pieces. Thats ok.
I’d much rather you, let your imagination free and loose; than for me to have a frame worthy work every time. With so much news to share, its been really challenging for me to choose which topic to begin with since my return from summer break. Summer? Yes, well, it is a wild and wet, brisk, winter here in Perth. But it is summer, in Seattle. The summer retreat at my sister’s was an opportunity, I couldn’t waste. We don’t see each other often. Living across the pond, as we do. I wanted to spend her birthday with her. It was a shorter holiday than planned. But we can infuse lifetimes, into an hour, if needs be, can’t we? We both made the time count. 35 days. To fill a well. LIFE Is Art. and, Art… is Life. As an artist, and an instructor, this is a message that is important for me to share. Most of the time, we had a fabulous summer retreat vibe going on, keeping it low key, staying in her lush green gardens. 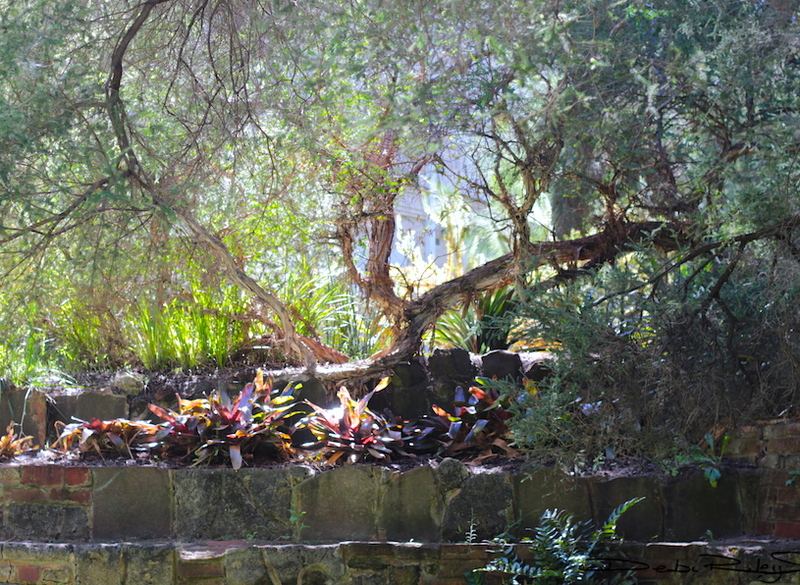 The lawns and gardens were filled with ponds, flowers and trees. Oh! and the most delicious raspberries, that I pilfered early each morning. Yum. Flowers… blooming right beneath my window. Incredible! My mornings were… oh wait, I’ll take you there! Before the sun arose, I watched the night fall away sliver by sliver, through my bedroom window. Until the light came streaming across the dew kissed lawn for a magical few seconds, and leaving me little time to snap a photo. I think I was more focused on the experience, than the ‘capture’ on those mornings. yes… more on the Process; less on the Product. I was mesmerised with the peek through view of looming ranges of the Cascade Mountains, that I could get by standing on my tip toes and looking east. For me, it seemed to add a touch of morning zen. Sometimes in blogs, we get carried away. Making it seem as if we’re living the life of Riley. Dilemmas, injuries, interrogations, all the usual suspects and then some, came out to try to cause mayhem. Hints of subtle context, perhaps so. Only the tips of the closest leaves are clearly seen, visible and identifiable. The rest of the rose is so softly diffused and dissolving. to pause and reflect a moment? Perhaps about the person who gave, or the person viewing, or even as a metaphor for some other and deeper things? As artists, we dig and delve. We fill our wells so that we may create with restored vitality, fresh imagination, wild creativity once again. There is of course more to come about this summer trek, including cobalt teal rivers, rainbow waterfalls, and demon hordes of thirsty mozzies set to drain us within 5 minutes of reaching our destination. Should be entertaining. Cheers. Who can resist roses with their beguiling perfume and lovely colored petals? They have a way about them, don’t they? With them…. its all sunshine and roses. Even though I now have a most delightful rose garden, I still get ‘inspiration’ elsewhere. I do the zen strolls around the bushlands and the neighborhood, finding new treasures to admire. I still, peer over into the neighbor’s garden. I have a studio, with 2 art tables and easels. I have 2 art tables set up on the patio. And still, many, many times I paint on the kitchen counter. It doesn’t really make sense. Especially to the someone who has gone above and beyond to assemble said studio, those tables and the gear for this ‘persnickety’ artist. What is it, about the kitchen counter? What does it have, that the other places…. don’t? I’ve never paused to contemplate this until now. This post, it made me think, it caused me to question things. How? Why? Where? When? All great questions, insightful, if we dig our way to the bottom of them. It does have a little bit to do with Light and yes with space too; but more than those, its about: Feeling. When I’m in the art studio, I am in isolation. art studio …. tidied up! I’m cut off from the other rooms, from whats going on elsewhere. I’m not part of the rest of the house. And that sensation fosters a tightening up. When I’m in the kitchen space, I’m perfectly at ease. All rooms connect. I feel Free and in the zone. I paint when no one is home, so there is a feeling of aloneness, but not, loneliness. That is a huge difference to me as I create. The kitchen area, its not a big space. Nor is it infused with an abundance of natural light. Its not the best lit room of the house. But it comes down to how I feel, when I’m creating in that space vs when I’m in the other spaces. I will always paint better, create better, when I am comfortable. I do love to paint and create out on the lawn; sitting near the rose garden. I feel free and loose and at home there. There is no sense of being cut off or isolated. I’m part of the whole. Thus, painting is easy there. I guess, the bottom line is that we just need to paint, create in the space – wherever it may be that makes us the most comfortable. How many of you, paint at the kitchen table or counter?